The halftime score of this game was 24-22 in favour of Concordia, a less than optimal start for a team coming off back-to-back wins. “The only reason the game was close in the first half was because we just missed too many shots—Including wide open threes” said Stingers head coach Rastko Popovic. What was keeping the Stingers ahead in the game was a tough defensive effort, highlighted by six first-half rebounds from guard Ken Beaulieu. The veteran also limited Laval’s Alexandre Leclerc—the league’s leading scorer—to zero points on zero-for-three from the field. Thankfully, this wasn’t quite a playoff game, but the Stingers knew they had to treat this game as any other game. The Rouge et Or had lost six games in a row coming into this one, and coach Popovic knew they’d be itching to get Suffrard off. The Stingers were up only 46-41 heading into the fourth quarter, but that would be the last time this game was in any doubt. For Beaulieu, his 12-point, 10-rebound night gave him his second consecutive double-double. Schneiders Suffrard put in 16 second-half points, finishing with a total of 21 on the night. 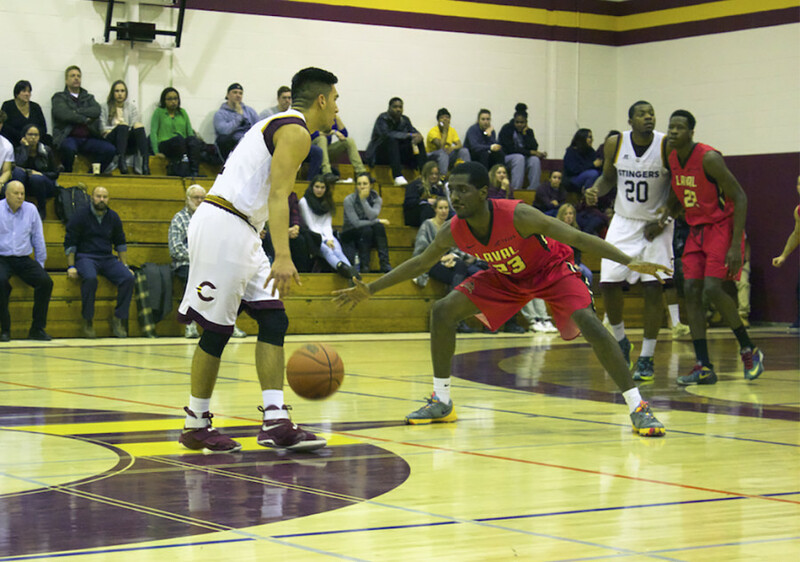 Before long, Concordia had built leads in the double-digits, and were running away with the game. A far cry from the first half, which saw them commit a paltry 10 turnovers. The Stingers got good performances from the players they rely on the most, but also were able to get solid contributions from their bench. Backup forward Henderson Charles put in 11 points coming off the bench, and backup point guard Cedric Coriolan put in eight points and had four assists in relief of starter Ricardo Monge who had an off night. The Stingers know it wasn’t the prettiest win, but with the playoffs fast approaching, it’s a win they’ll gladly take. Their next game is Saturday against these very same Rouge et Or in Quebec City, where they’ll be looking to make it four in a row. “We have a big game Saturday, going into their gym,” said Popovic. “We have to do the same thing defensively, prepare for it. I told the guys, everyone can still do something better, to be better as a team on Saturday.